If you have the WWE Network, odds are you hit a variety of programming the fed has on offer. There are the monthly pay-per-views (or events, as WWE briefly tried to push them), the original programming, and a mammoth library of classic wrestling tapes, stretching from the early days of the modern era. WWE decided at some point after purchasing WCW that it would set itself up as the custodians of wrestling history. This was not and is not entirely, or even mostly, altruistic; WWE brass realized early on that there was money to be made cashing in on the sheer volume of footage the purchases of WCW and ECW brought with them. This was only compounded as WWE snatched up more and more tape archives from dead territories: WCCW, AWA, GWF, Smoky Mountain, Stampede, and more. Altruistic or not, WWE curates the history of North American professional wrestling, and there does seem to be a sense that, whatever the business behind it, the WWE board takes that role seriously. That’s seriously by pro wrestling standards, though—this isn’t Smithsonian history. It’s still a carny world where they tweak and nudge history as the ultimate victors of the century long battle between the territories. Still, this is what we have, and pro wrestling as an art form is steeped in its past. There is no “now” without a “then,” preferably a “then” which shows up on Raw from time to time. And for that “then” to have impact for new fans, who may be unfamiliar with who is on the screen, WWE has to make sure the past is never far away. This is a key driver of WWE’s business, particularly, but pro wrestling, generally. Continuity is a key part of wrestling’s appeal. The idea that everyone is living within a single storyline stretching back decades, oftentimes with a promotion (like WWE) as the protagonist, is what gives the form a canvas to paint on. Because of this, when you hop on the Network to watch an old Starrcade, it’s not just that WWE is making money off of the direct act of you subscribing for classic wrestling; it’s that your interest in the old event contributes to a larger cultural thrust which allows the new events to maintain their appeal. The problem is that, whether in the micro sense of you watching Starrcade or the macro sense of the history of pro wrestling as curated by WWE pushing current business forward, the old wrestlers aren’t getting paid. Ricky Morton isn’t getting a royalty check when you watch a Rock n Roll Express match. WWE’s not going to toss One Man Gang health insurance if he’s really popular on the Network. So it was that WWE found itself the target of a class action lawsuit last month by former employee Rene Dupree. Dupree debuted super young with an angry, arrogant Frenchman gimmick in 2003. He and his partner, Sylvain Grenier (both are French-Canadian, but this is WWE), had a run with the tag titles and got good heat at the time. Dupree stuck around for about four years before moving on to the indies and Japan. The lawsuit was dismissed voluntarily, according to F4WOnline, because of an existing royalties agreement between WWE and Dupree. The question of royalties and what’s fair still lingers, however. It’s certainly possible to tell with sharp datamining how many Network subscribers spend most of their viewing time watching old matches and with which wrestlers, but we’re not privy to that. It’s doubtful that anyone outside the McMahons’ inner circle would have access to it, and it’s even more doubtful that WWE is looking at their data in that fashion, regardless. So we’re left with the knowledge that existing royalty agreements are arcane or non-existent. This dovetails neatly with the fact that the status of pay-per-view bonuses for currently employed wrestlers are still in murky territory. The Network’s launch was by no means disastrous, but 1 million people moving from paying for individual pay-per-views to a model with a predictable, but lower per head, investment meant that WWE’s prior payment model, based on bonuses linked to pay-per-view buys, was punctured. In 2014, shortly after the Network’s launch, there was a rash of stories about wrestlers and staff who were livid over shrinking checks in the wake of this shift. Indeed, one of CM Punk’s grievances on his way out was the sudden cut in PPV bonuses. WWE’s been trying to make up the difference with bigger merchandise cuts and the like to make up the difference. The problem is that pay is no longer pegged to a single, objective number as it was in the pay-per-view era. That creates problems of clarity and opens the door for management abuse, as suddenly the measuring stick for worker pay becomes a potentially very subjective thing. 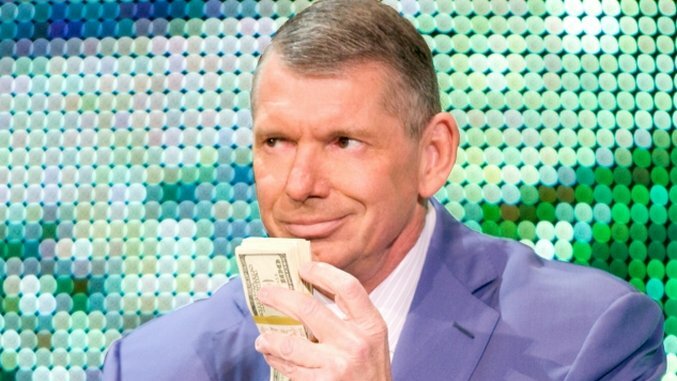 Those may not seem related, but they are in the sense that, from both the outside and what we can glean from WWE wrestlers past and present, the payment structure in WWE has fundamentally shifted in the wake of the Network’s launch and WWE doesn’t seem entirely prepared to fill the gaps. What’s more, the shift is happening in a time of increased revenues but historically low profits. These charts from Chris Harrington, broken out from earnings reports, show that WWE profits are lower than at any time since the mid-2000s. WWE will pull through, almost certainly, but the payment model, from royalties to bonuses, seems at best subjective and weird; at worst, it’s open to outright abuse and graft. Certainly, there’s a strong argument for clarification on how people at WWE are paid. Further, it is only fair that the old timers who were never under WWE contract deserve something from those midnight viewings of old NWA and AWA matches. A match from decades ago is still, in terms of labor, something created by the laborer, even this far out. For those wrestlers to get nothing in exchange for creating value for a company they barely have contact with is something which should change. Ian Williams has written for Salon, Jacobin, The Guardian and more.